Although UFC champ Brock Lesnar handed Shane Carwin his only pro blemish en route to unifying the heavyweight crown, Carwin believes Cain Velasquez will be donning Octagon gold when UFC 121 is all said and done. Although Lesnar is an early 1.5-to-1 favorite to retain his bling-bling belt, Carwin claims a new king will be crowned inside the Honda Center in Anaheim, California. Carwin and Twitter buddy Roy Nelson are scheduled to co-headline “UFC 125: Resolution” on New Year’s Day. It’s believed the winner will fall in line behind Junior dos Santos for next dibs at the title. JDS earned his top contender status when he posted a unanimous decision win over Nelson at UFC 117. 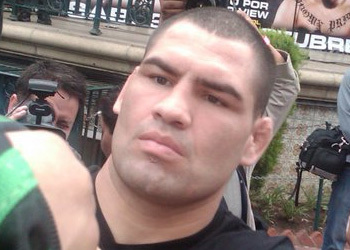 “Schaub vs. Gonzaga – Gonzaga is a tough fight for anyone in the UFC. He brings heavy hands and amazing BJJ to the table. Brendan is young, but every bit as powerful as Gonzaga. Brendan has the momentum and I think he will win this close fight. Ortiz vs. Hamill – I think Matt Hamill pulls out the victory. Tito is a very tough opponent, but I think Hamill matches his wrestling and if Hamill attacks he should win. The big question is; will Hamill put his friendship on the sideline for this fight? Sanchez vs. Thiago – I think Sanchez will outwork Thiago. He keeps coming and his cardio and drive are going to be the deciding factor.